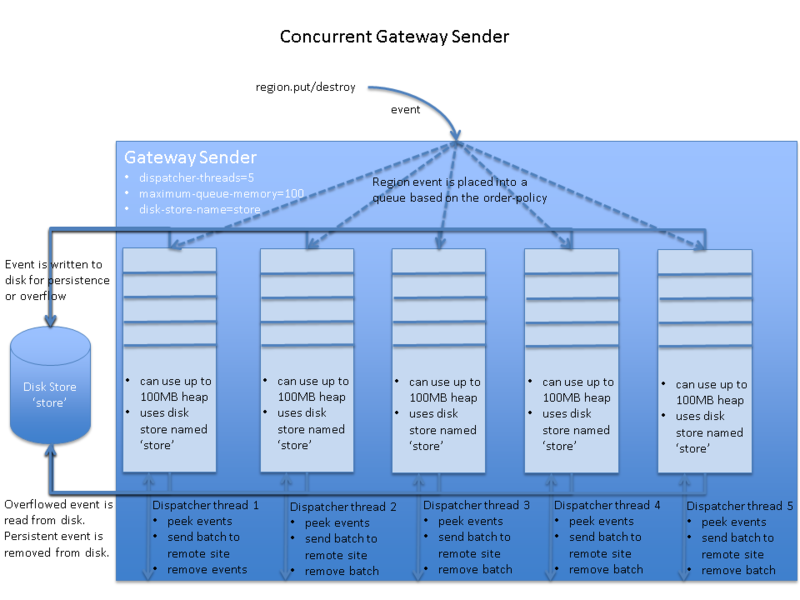 By default, a gateway sender queue or asynchronous event queue uses 5 dispatcher threads per queue. This provides support for applications that have the ability to process queued events concurrently for distribution to another GemFire site or listener. If your application does not require concurrent distribution, or if you do not have enough resources to support the requirements of multiple dispatcher threads, then you can configure a single dispatcher thread to process a queue. When multiple dispatcher threads are configured for a parallel queue, GemFire simply uses multiple threads to process the contents of each individual queue. The total number of queues that are created is still determined by the number of GemFire members that host the region. When multiple dispatcher threads are configured for a serial queue, GemFire creates an additional copy of the queue for each thread on each member that hosts the queue. To obtain the maximum throughput, increase the number of dispatcher threads until your network is saturated. The following diagram illustrates a serial gateway sender queue that is configured with multiple dispatcher threads. Queue attributes are repeated for each copy of the queue that is created for a dispatcher thread. That is, each concurrent queue points to the same disk store, so the same disk directories are used. If persistence is enabled and overflow occurs, the threads that insert entries into the queues compete for the disk. This applies to application threads and dispatcher threads, so it can affect application performance. The maximum-queue-memory setting applies to each copy of the serial queue. If you configure 10 dispatcher threads and the maximum queue memory is set to 100MB, then the total maximum queue memory for the queue is 1000MB on each member that hosts the queue. key (default). All updates to the same key are distributed in order. GemFire preserves key ordering by placing all updates to the same key in the same dispatcher thread queue. You typically use key ordering when updates to entries have no relationship to each other, such as for an application that uses a single feeder to distribute stock updates to several other systems. thread. All region updates from a given thread are distributed in order. GemFire preserves thread ordering by placing all region updates from the same thread into the same dispatcher thread queue. In general, use thread ordering when updates to one region entry affect updates to another region entry. partition. All region events that share the same partitioning key are distributed in order. Specify partition ordering when applications use a PartitionResolver to implement custom partitioning. With partition ordering, all entries that share the same “partitioning key” (RoutingObject) are placed into the same dispatcher thread queue. To increase the number of dispatcher threads and set the ordering policy for a serial gateway sender, use one of the following mechanisms.